If you can still remember my 20 before 2020 list, you'll know that food is the very reason why I wanted to travel to Hanoi. Yes, FOOD, particularly the savory Vietnamese noodle dish called Pho! 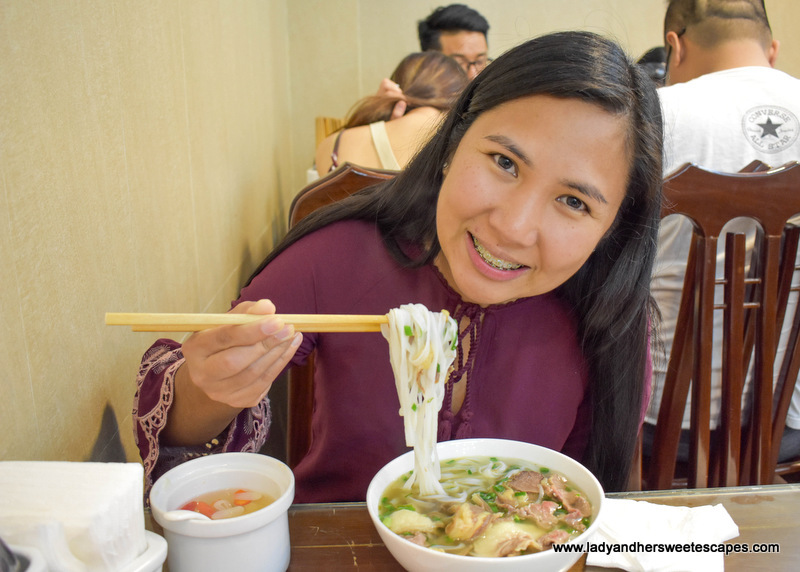 I have eaten pho many times in Manila, in Bacolod and in Dubai, and I always thought: if this tastes good, then how much more in its birthplace - Hanoi! 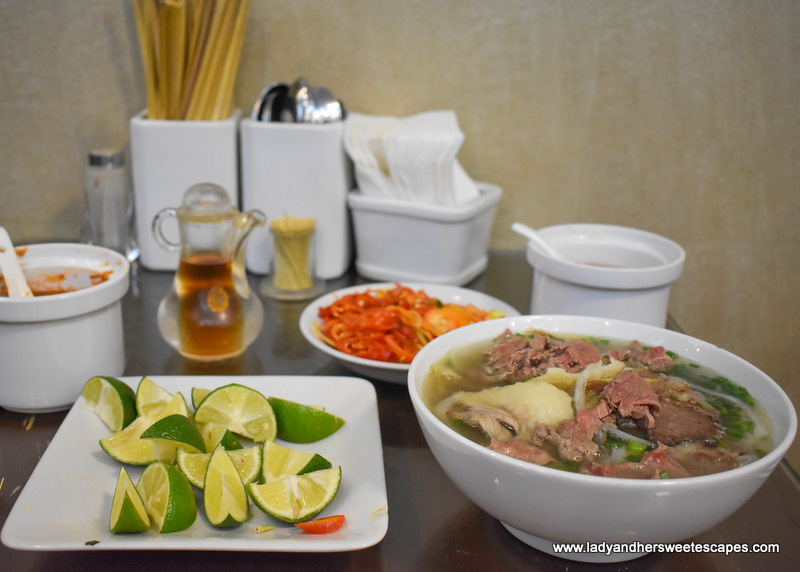 So, during our short trip to the capital of Vietnam, I devoured five bowls of pho. That's almost two bowls per day. Hahah! 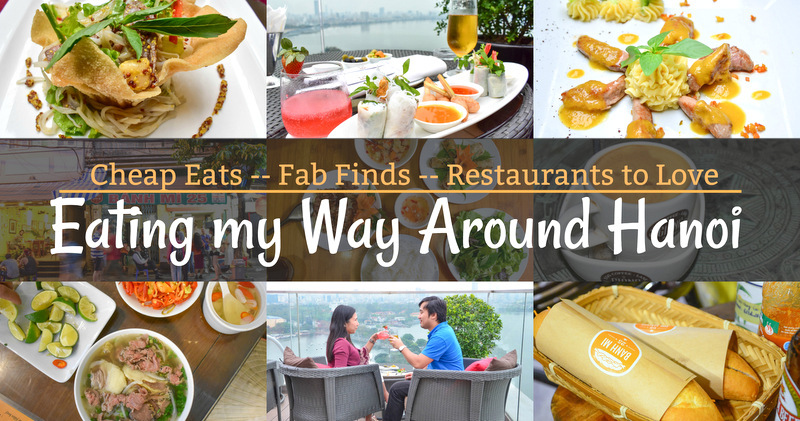 Ed and I also got to sample other delectable Vietnamese dishes, and concluded that if you are into gastronomic journeys, Hanoi is the perfect place to go as it is a foodie wonderland! 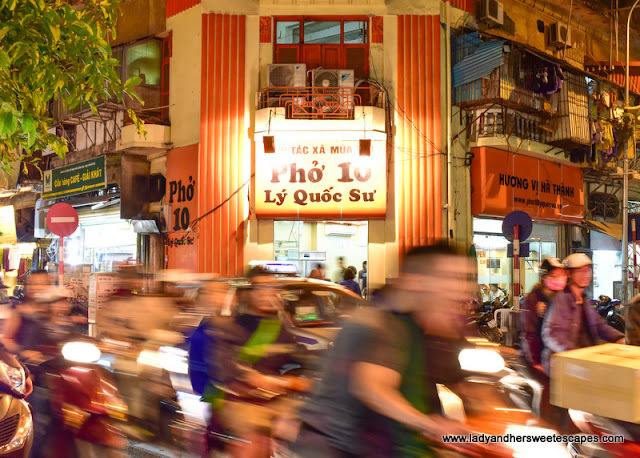 Right in a corner of the bustling 10 Ly Quoc Su street in Old Quarter is an equally hectic pho restaurant. It is small, yet with a big orange sign above the entrance door; hence nobody can miss it! 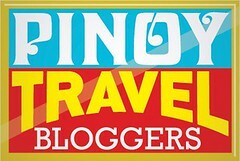 I was not surprised to see a long queue outside because I heard it's quite famous for both locals and tourists. Ed and I queued for a few minutes until we were directed to sit in a table for four which we have to share with another guest. Pho 10 Ly Quoc Su has a vibe of a carinderia in the Philippines. No frills, but diners don't mind! People come here for a good (I mean, the best) bowl of pho, and this humble restaurant did not disappoint! There are 10 varieties of pho on the menu. Ed and I chose to have the Bat Dac Biet or the Special Bowl because, needless to say, we wanted our dinner in this famous restaurant to be "special". And indeed, it was! Our orders came straight out of the open kitchen and left us speechless for quite a while. We quietly devoured the silky noodles, heartily ate the meltingly tender beef, and slurped down the rich savory broth! Best pho I have ever had? Definitely YES! Our bill for 2: 180,000 VND. That's only around 30 AED! 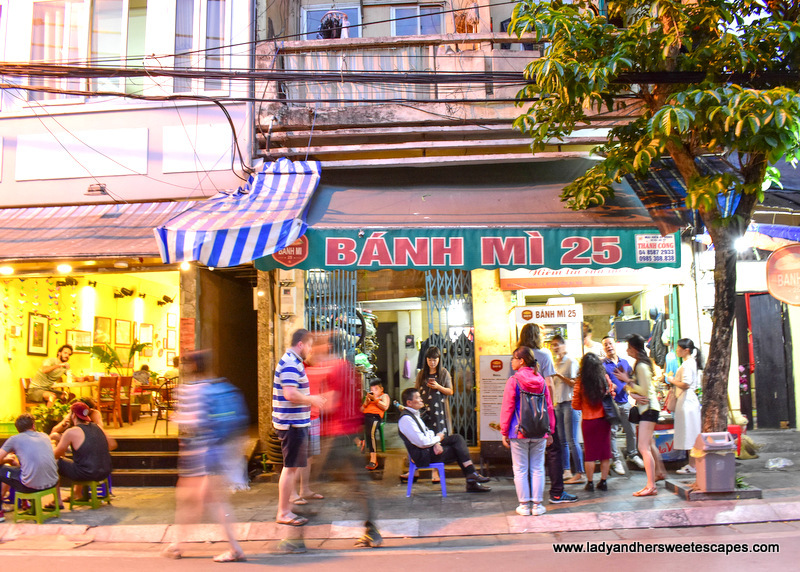 Another gem in the streets of Old Quarter is Bahn Mi 25. It is a little food stall in 25 Hang Ca street selling bahn mi or baguette sandwich. I heard it's a must-try, I honestly had no high expectations though. 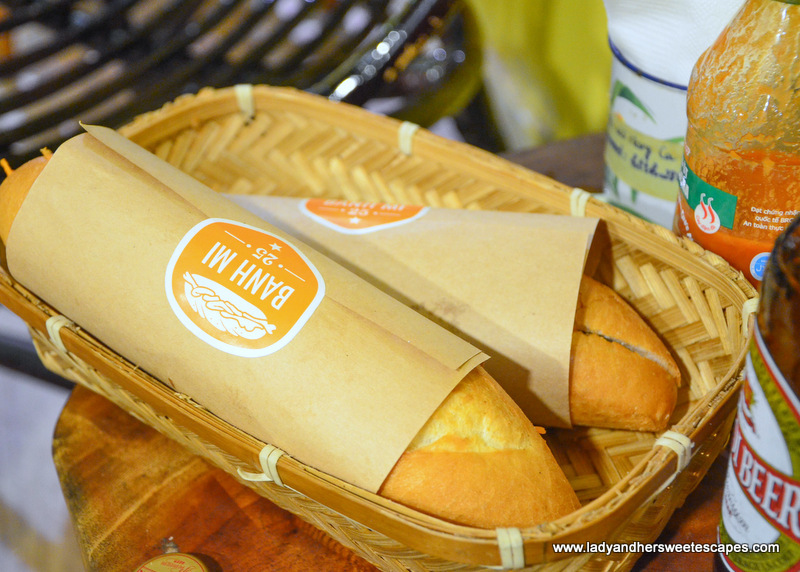 I thought it would be just another sandwich, but lo and behold, Bahn Mi 25 offers a mouthwatering French-Vietnamese food fusion! Bahn Mi is basically a baguette sandwich done Vietnamese style! The thin-crusted bread is soft and fluffy. It is filled with all sorts of ingredients. I had mine with all things pork; pate, barbecued pork, jambon and sausage. It is a cheap, tasty and filling treat that I would surely have again if we stayed longer in Hanoi. Finding Giang Cafe is a challenge. Ed and I missed it on our first night in Hanoi although we were armed with Google Map. After several attempts on our last night, we successfully found it hidden in a small alleyway in 39 Nguyen Huu Huan! 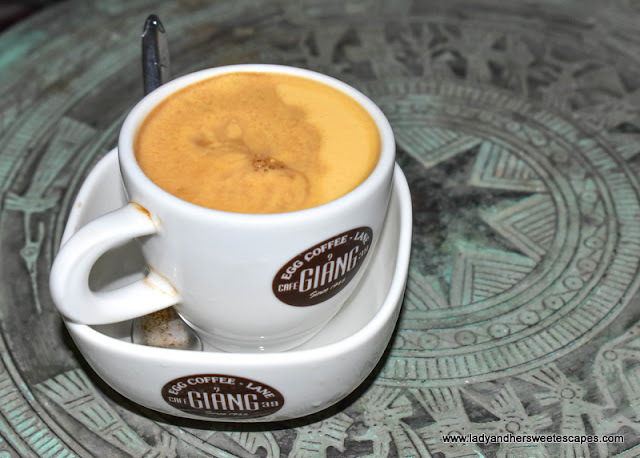 So, what exactly is Egg Coffee or ca phe trung? It is a Vietnamese drink made of sugar, milk, Robusta coffee and egg yolk! It has sweet, creamy, bitter layers that all together make a complex yet to die for concoction. While searching for romantic restaurants in Hanoi, I stumbled onto Green Tangerine in Old Quarter. It is a fine dining venue situated in a beautifully preserved French-colonial villa. 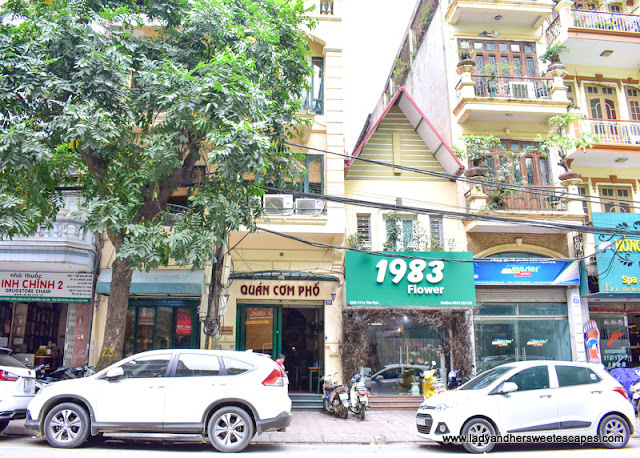 I had a case of love at first sight with it that I immediately placed an online reservation for our first meal in Hanoi. Ed and I went there just as planned. We were amused to find the Parisian-like restaurant in midst of the hustle and bustle of 48 Hang Be street. 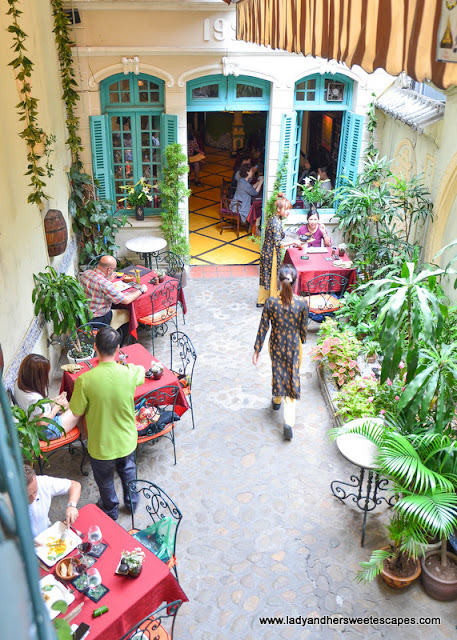 We dined in its lovely courtyard, and it was perfect! 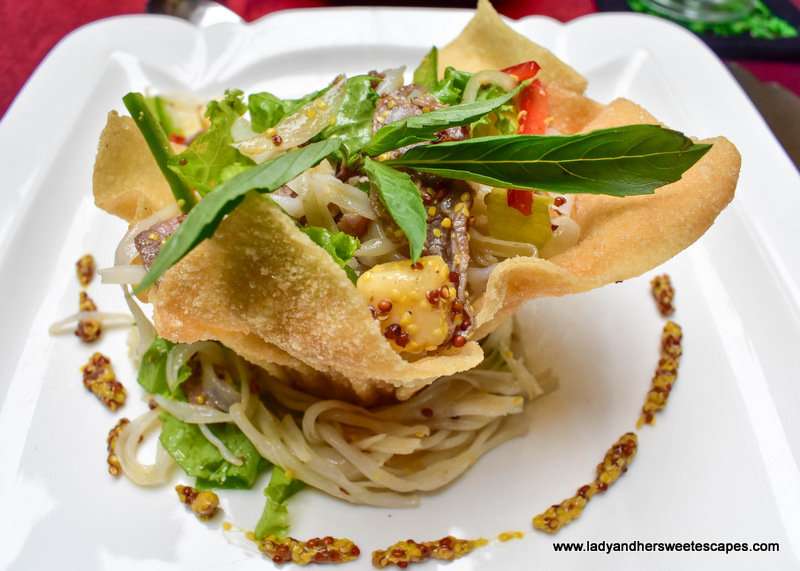 Green Tangerine serves sophisticated French-Vietnamese gourmet cuisine. Ed had the 2-course set meal, while I had the 3-course because no way I'm skipping dessert! Each dish was sublime. The presentation is classy and the fusion of two distinct cuisines is excellent! 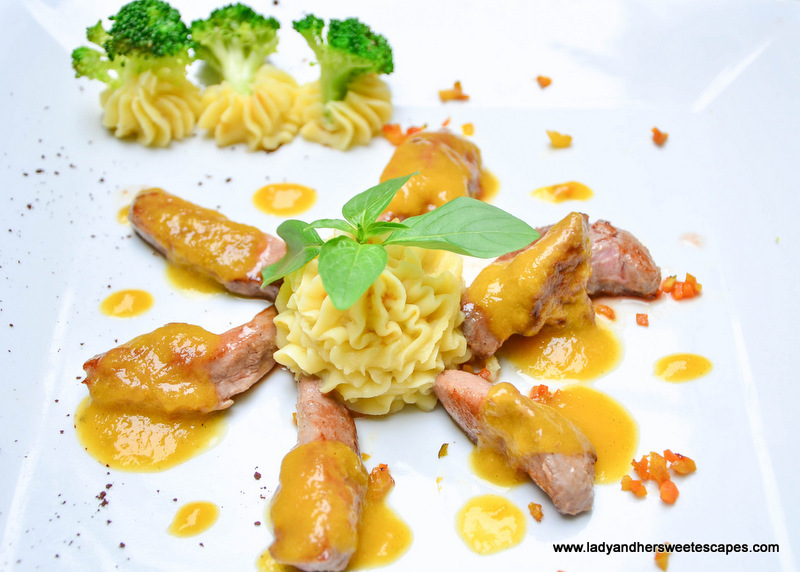 I would never forget the duck fillet in mango and rum sauce! It has a strong similarity to the decadent duck fillet I had in Paris, but with a fruity Vietnamese twist! Bill for 2 at Green Tangerine: 860,000 VND or 140 AED. Not bad for fine French-Vietnamese meal. I'm a huge fan of restaurants or lounges with a view. I always include one on our itinerary whenever we travel. 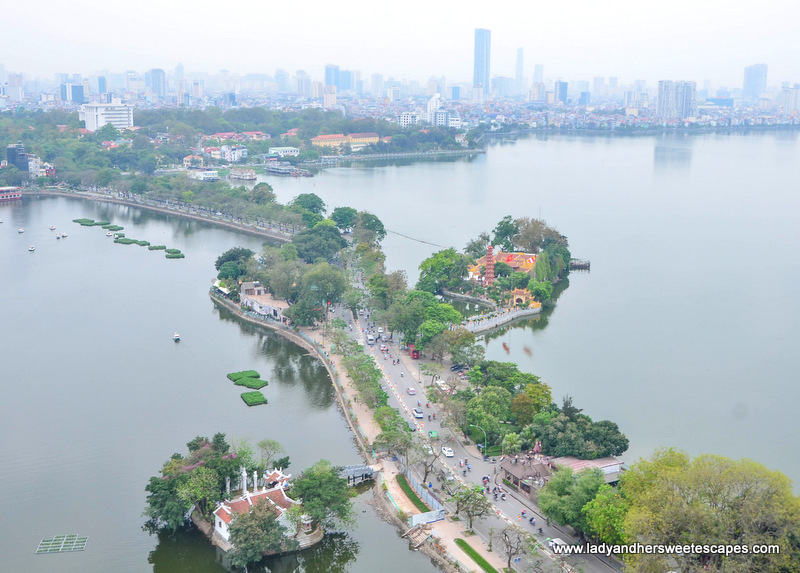 And for Hanoi, I picked The Summit at Pan Pacific Hotel. 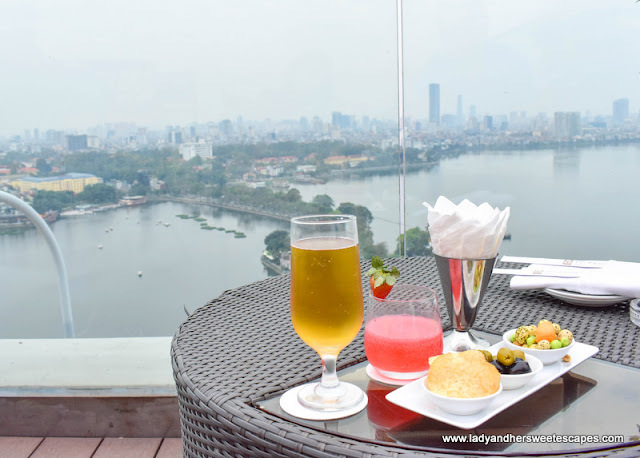 The rooftop lounge, perched on the 20th floor of the hotel, offers unobstructed panorama of the West Lake and Hanoi's dense skyline. Ed and I went there just in time for the sunset and the happy hour. It was a serene spot to enjoy some drinks; quite the perfect reward for learning how to cross the motorcycle-jammed streets of Old Quarter without being hit! Hahah! We shared a platter of gourmet bar food, sipped on signature cocktails and waited for the golden hour. Cheers to discovering new places, learning along the road, and loving every step of the way! 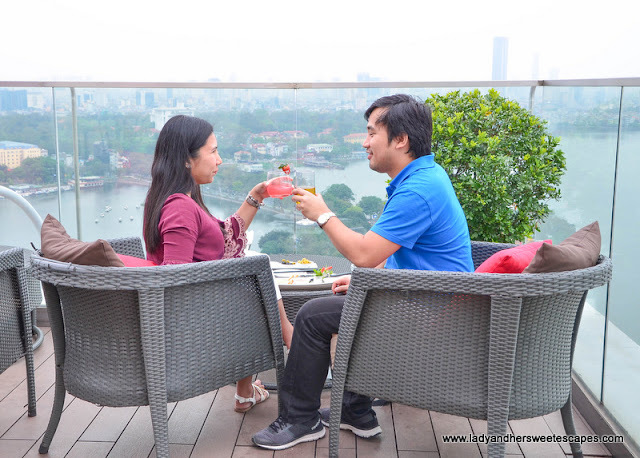 Bill for 2 (drinks and appetizer platter): Around 700,000 VND or 113 AED. A-ok with this kind of view! 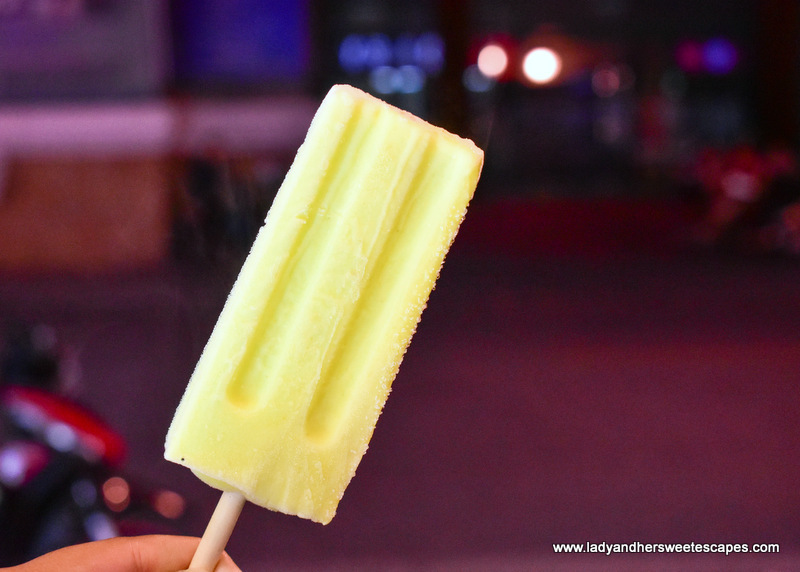 Kem Trang Tien or Trang Tien ice cream is a Hanoi institution! The ice cream parlor opened in 1958 and remained a local favorite up to this time. We didn't have to check the map for its location. The moment we saw a trail of people standing along the street with ice cream on stick, we knew we're in the right path! In this Instagram era when desserts have to be aesthetically pleasing, Trang Tien ice cream remains traditional and delightfully simple. Ed and I tried the classic flavors Kem Com (ice cream with green rice flakes) and Kem Cacao (chocolate), and we were both impressed. We love the smooth texture, the creamy and straightforward taste, and the surprisingly cheap price! 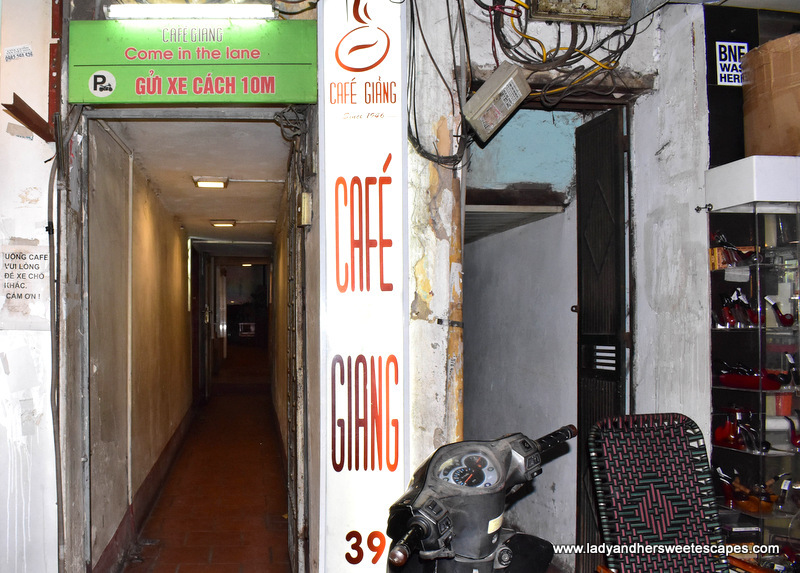 With a few Vietnamese Dong left in our pockets, Ed and I searched for a budget-friendly restaurant in French Quarter on our last day in Hanoi. We thought it would be hard to find one as the area is famous for 5-star hotels and gourmet restaurants, but thankfully, Quan Com Pho is just a few minutes away from our accommodation. Quan Com Pho is popular for home-style cooking. Dishes are served simple and authentic. As the restaurant is inside an old colonial building and most diners are locals, I somehow felt I was invited to dine in Vietnamese home! We had Bun Cha - a famous Vietnamese dish which originated in Hanoi. It was our first time to have it; hence, we "spied" the nearby table for a Bun Cha 101. 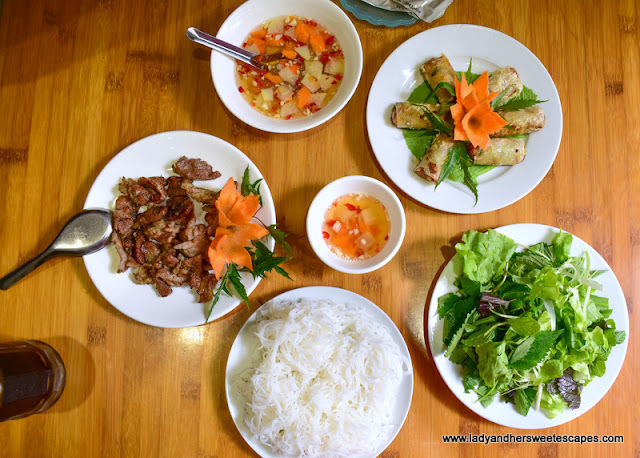 The ingredients (grilled pork, fresh herbs, rice vermicelli, dipping sauce) are served separately and we get the freedom to mix everything all together, or just whatever we like, in a small bowl. Bun Cha is an excellent dish that even Obama couldn't afford to miss! Well, yeah, he had bun cha in a different restaurant, but Quan Com Pho also got a seal of approval from the locals.